Many advertisers are confused by the difference between native advertising and content marketing. Native advertising refers to a single and detailed way for marketers to distribute content, and content marketing refers to a larger practice of advertising and content distribution overall. The goals of content marketing and native advertising are very different. While both want to increase brand awareness, content marketing is also projected to drive conversions. In this case study, will help you understand the difference between Content Marketing and Native Advertising. 86% businesses now leverage content marketing in one form or another. More than 67% clients ask their content marketing agencies about native advertising. 70% audience wants to learn about products via content instead of direct advertisement. Native ad headlines generate 308x more customer attention than images or banners. Native ads earn 53% more views than traditional banner ads. Content Marketing is a marketing way that includes creating ‘valuable’ and ‘useful’ non-promotional content by brands. Buffer is a social media-tracking app. It lets you schedule posts and tracks your growth via social media. 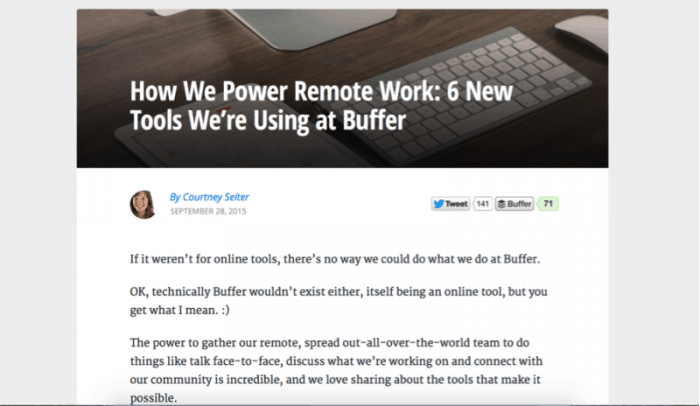 Buffer Open Blog is a perfect example of perfect marketing strategy. Native Advertising is a form of paid advertising where the content put out seems similar to the native content of the platform. You would have come across one or the other form of native advertising daily – while reading an e-newspaper, browsing through an e-commerce portal or on your favorite Google Search Engine. Research your audience well to create and experiment with multiple hooks to see what works well for your audience. Do not shy away from allocating a good budget for this to show results. 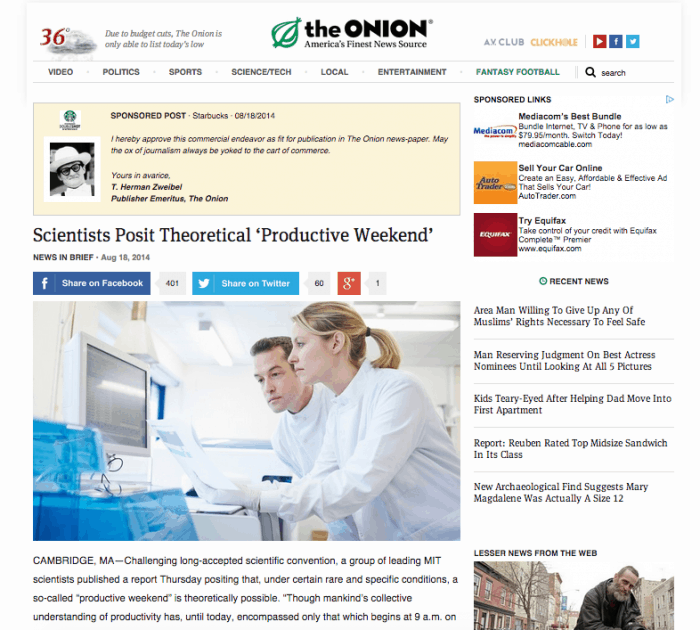 Starbucks partnered with The Onion to promote its Doubleshot Espresso by sponsoring a post on productivity on the weekends. Native advertising can form a part of the content marketing strategy. It is one form of channel available to marketers to help distribute content. However, content marketing is not native advertising. Instead, it is the bigger picture, in which all of your marketing comes together under one strategy to increase engagement, build deeper customer relationships and drive sales.